With the skyrocketing cost of tuition and the frustrations of an economy trying to turn-around, there should still be a glimmer of hope for many students going into public service jobs. In 2007 the Public Service Loan Forgiveness Program (PSLF) was created by Congress to encourage full-time employment in public service jobs. New income based payment plans were introduced and, under certain conditions, a borrower may qualify for forgiveness of their loans after 10 years of payments. Tip of the hat to Seattle University Law Library's blog. Canadian law professor Allan C. Hutchinson tells the stories of eight cases in Is Eating People Wrong? 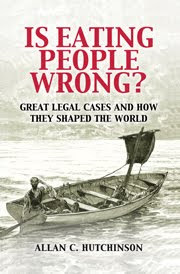 Great Legal Cases and How they Shaped the World (K370.H88 2011 at Classified Stacks). His big theme is the development of the common law through particular cases. Along the way, he offers more complete stories about some famous cases than you will ever find in a casebook or appellate opinion. You can read the book for Hutchinson's observations about the common law as "a messy, episodic, and experimental effort to respond and adapt to the contingent demands that the society brings forward." (p. 11) Or you can dabble in it to read the colorful stories about the unfortunate cabin boy, the contested fox, the mill's broken shaft, and more. The publisher's page about the book is here. The WorldCat record (with links to other libraries) is here. It is well known that most law students in the U.S. have free [seemingly unlimited] use of major online subscription research databases. But use of these databases is an educational privilege and restricted to educational and nonprofit purposes (research and studies). The Utah State Bar Ethics Advisory Committee found that an attorney’s misuse of a student’s educational Lexis or Westlaw access is not only an ethical violation but also amounts to theft of services, a criminal act (a potential felony). According to the Committee’s November 15, 2011, ethics opinion, “numerous” students have reported that their “initial or continued employment” has been conditioned upon a willingness to violate their agreements with respect to research services. Do You Have a Short Story in You? The Journal of Legal Education (a publication of the Association of American Law Schools) and Southwestern Law School have announced the first JLE Legal Fiction Contest. Submissions must be original short works of fiction related to law school or the practice of law, and winning entries will be published in a future issue of the Journal of Legal Education. The submission deadline is March 15, 2012. The panel of distinguished judges will include Michael Connelly, author of bestselling legal-themed novels such as The Lincoln Lawyer, The Brass Verdict, The Reversal and the newly released The Drop. His recent book, The Fifth Witness, featured a character called "Bullocks" who is a recent Southwestern graduate. In agreeing to participate as a judge, Connelly said, "I'm excited to be involved because it's been fun for me to include Southwestern in my novels. But I am also a reader and always looking for good storytellers. I think this should be interesting. I'm looking forward to what comes in." Connelly will be joined on the panel by author Denise Hamilton (Damage Control, The Last Embrace), writer Marshall Goldberg ("L.A. Law," "Paper Chase," "Newhart," "It's Gary Shandling's Show") and Charles Rosenberg (legal consultant to "Paper Chase," "L.A. Law," "The Practice" and "Boston Legal," and author of the recently released legal thriller Death on a High Floor). The contest is open to lawyers and non-lawyers, academics and non-academics - anyone setting a fictitious story in a legal setting (law school, law firm, courtroom, legislature, judge's chambers, etc.) or focusing on a law-related character (lawyer, law professor, judicial clerk, etc.). According to Marshall Goldberg, "The long hours, the ethical conflicts and the differing notions of justice all force hard choices upon law students, practitioners, judges and academics - and these struggles can make powerful fiction." Submissions must be in prose form (no screenplays or scripts), previously unpublished, under 5,000 words (approximately 20 typewritten pages) and submitted by March 15, 2012 (click here for full requirements). Entries will be reviewed anonymously and judged on originality, quality of writing and depth of character. The ten winners will be announced in June 2012, and their stories will be published in the Journal of Legal Education: The Fiction Issue in early 2013. Additionally, the ten winners and ten runner-up entries will be posted online. Authors will retain copyright ownership. In applauding the creativity of the Journal of Legal Education editors at Southwestern in designing the competition and recruiting such an impressive panel of judges, Susan Prager, Executive Director of the Association of American Law Schools, said that she is "eager to see the first published pieces in the competition" and predicts that "these will prove of enduring interest and value." She added: "I only wonder if we will need to deliver more copies of the Journal to our member law schools!" Assistant Dean Molly Selvin, the managing editor of the JLE and coordinator of the contest said, "In some quarters the legal world is considered stiff and colorless. The Journal of Legal Education and Southwestern Law School believe this contest will help dispel that misimpression, and happily welcome all submissions." 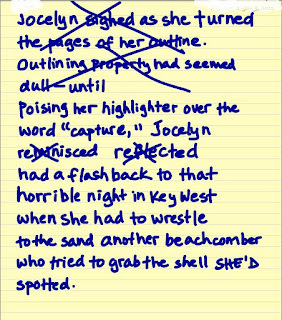 Graphic: mw, using Notes Plus app. If you'd like to see short comments about what's going on at the AALS meeting, you can skim the tweets at www.twitter.com/aals12. You will see a variety of notes, from petty gripes to interesting insights. Balance in law school: isn't that an oxymoron? Not according to the members of AALS's Section on Balance in Legal Education who think it's rare but definitely worth striving for. This morning a panel of speakers shared information about classes, workshops, and student projects at their law schools: the City University of New York (CUNY), Vanderbilt, Miami, Phoenix, and UW. The speakers included faculty and staff, current students, and a recent grad. Prof. Kim Ambrose and Dean Michele Storms spoke about some of the programs at the UW. To get an idea of student-run programs, see the websites of the Insightful Mind Initiative (Miami) and the Vanderbilt Student Health and Wellness Association. Elizabeth Coplan, Director of Media Relations & Marketing, is on a panel about partnering with law firms for the Section on Institutional Advancement. Associate Dean Penny Hazelton is moderating a panel about law libraries responding to changing curricular and scholarly needs of faculty and students in times of limited resources. Prof. Anita Krug is speaking on implementing Dodd-Frank. Prof. Joel Ngugi – now Judge Ngugi of Kenya's High Court – is on a panel about the International Criminal Court's focus on Africa. Prof. Kate O'Neill is moderating a panel about teaching professional values across the curriculum. Prof. Arzoo Osanloo, from the UW's Law, Societies & Justice Program, will speak on marriage and divorce in Islam. Prof. Kim Ambrose and Assistant Dean Michele Storms are on a panel about faculty-student collaborations and student initiatives. Prof. Zahr Said will speak on integrating law and the humanities into the core curriculum. Prof. Sallie Sanford will be on a panel about health law professors' projects outside the traditional classroom; her paper is on teaching health law in rural Ethiopia. 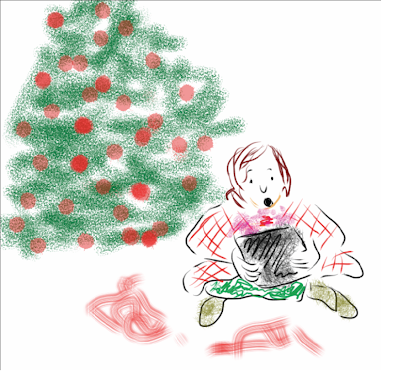 Did you get a new device over the break? Perhaps you are long past looking for a bicycle under the Christmas tree – maybe you have to buy your own toys and tools. But no matter how you got your bike, iPad, Android phone, or laptop, it's a good idea to keep track of it. Did you know that you can register bicycles and electronics with the UW Police? They keep track of the serial number and other identifying information and if, heaven forbid, something is lost or stolen, that registration can help get it back to you when it's found. You can get a sticker from the UW Police to show that you've registered your bike or device, and that might deter some thieves. The best deterrence is keeping an eye on your things. If you need to take a bathroom break or a coffee break, take your things with you or have a friend watch them. It doesn't take long for a thief to pick up a laptop! You can buy a security cable to lock your laptop. All of the Law Library's tables and carrels have brackets underneath to anchor the cables. The University Book Store Tech Center carries at least one kind. Or to see a lot, visit Amazon.com and search for laptop security cable. And of course, thieves who take you whole device are not the only threat. You also don't want your computing life messed up by viruses, crashes, or identity thieves. See UW IT Connect's page on Safe and Secure Computing. See also Six Tips to Safeguard Your Mobile Devices, Law Technology News, Jan. 2, 2011. Graphic: cartoon of iPad under the tree, drawn on my iPad, which I just registered with UWPD. video – excerpts from the interrogation, plus recent interview with the defendant, Nga Truong, and reflections by the reporter, David Boeri. Hearing (or viewing) the questioning is much more vivid the reading a discussion of a coercive interrogation in an appellate opinion. This is very valuable reporting.